Everything is back-to-school this month and nothing is more gratifying than sending your troops off armed with healthy and nutritious snacks and lunches. Here is a fab Back to School Lunch Idea! 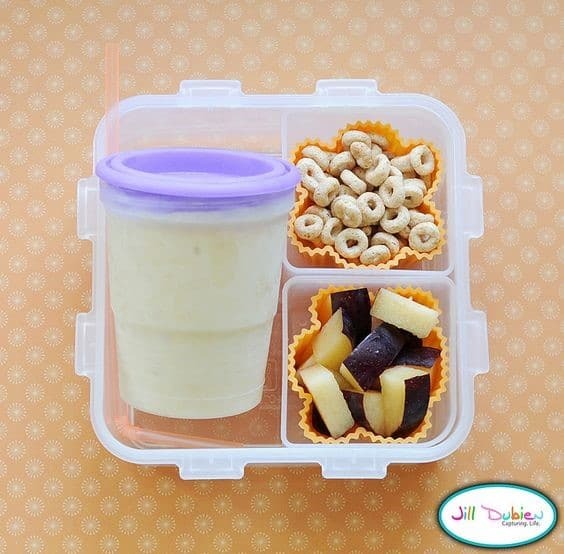 Make your kid’s favorite smoothies and freeze them in a plastic / glass to-go container that has a seal-able lid. Put the frozen smoothie in your child’s lunch. By lunch time the smoothie should be soft enough to eat, all while keeping the lunch cold. The great thing is that you can pop these into any family member’s lunch pack – even yours! Why pack frozen homemade smoothies? Freezer smoothies work best when they are extra thick – bananas, oats, and yogurt can help with this. Keep your solid-to-liquid ratio at about 4:1. Going into the container the mixture should be thick and scoop-able if you’re making them with frozen fruit. Fill half-pint mason jars or freezer cups three-quarters full with the smoothie mixture. Then cover and freeze until completely solid, up to three months. 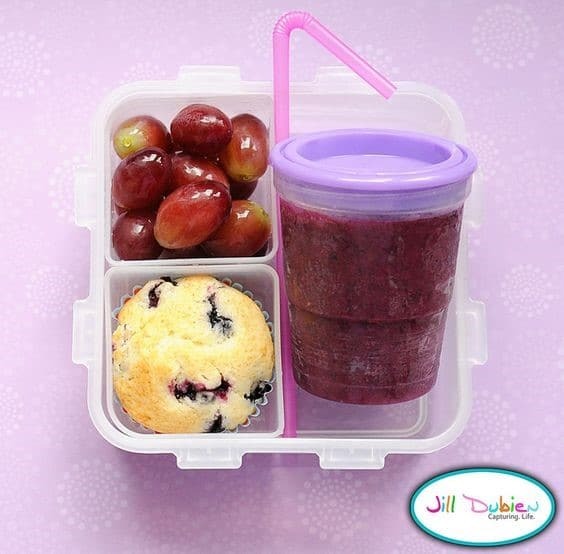 Tuck the frozen smoothie into an insulated lunch bag with a small cold pack. Before eating, shake thoroughly. Prep your containers. 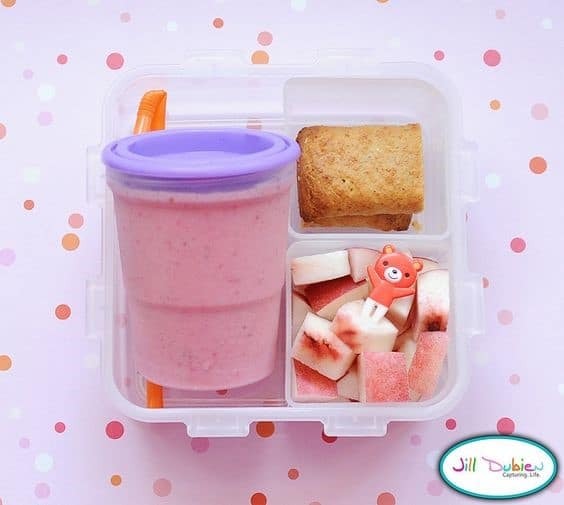 If you’re making lunch box smoothies regularly, you’ll want to make sure you’ve cleaned and gathered up all your containers before you make your smoothie so you can fill them up without your smoothie melting. Make your smoothie. Make one up on the fly or use one of the recipes we’ve shared below. You can also just fill up a container or two as you go using smoothie leftovers. Fill your containers. Leave a little space at the top for the smoothie to expand while freezing. Freeze, overnight is best, but if you have small containers, the smoothies should be frozen within a few hours. Pull out and pack. Make sure to include a straw or spoon if necessary. Retrieve and clean containers. Get those containers back from the lunch box and clean as soon as possible. Cups with caps. We like to use glass mason jars for your tweens and teens, and for the smaller kiddies, we strongly recommend plastic freezer cups. Plastic smoothie straws are easy to find in stores, but if you’re looking for a reusable option, you can find stainless ones, too. You could also throw in a spoon straw just for fun! I like this spoon/fork combo for kid lunches. Cloth napkins are great for cleaning up spills or wrapping up sticky containers and utensils. All ingredients based on one serving per person. Add ingredients to your smoothie blender and blend until smooth / reached desired consistency. Decant into your freezer friendly containers and simply add to the lunch pack (s) in the morning. We have used Früt Wildblossom Honey throughout to ensure that the smoothies have that sweet taste that kids love – but the healthy kind! Chia seeds are extremely rich in nutrients and keep you feeling “full” for hours. We use this as an on the go breakfast popsicle recipe too.